More clothing swap fun. After clothes were tried and claimed, dress up began! 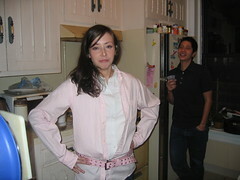 K. tried to construct a “pretty in pink” type outfit, but F. had other ideas about what it looked like.